The Soviet Jewry movement was born in Israel’s 1967 victory in the 6-Day War. The burst of pride among American Jews motivated them to agitate for the rights of oppressed Jews in the USSR. “We were no longer powerless, and no longer alone,” said former Refusenik Natan Sharansky. Jewish activists travelled to the Soviet Union, excited to deliver Hebrew books and ritual objects, aware of what American Jewish activism could have accomplished 40 years earlier. They were determined not to sit idly by and watch another generation of Jews live in oppression. Today many are concerned about what Jewish students do not know about the story of the struggle for freedom for Soviet Jews. Are you ready to tell them about this important chapter in American Jewish history? 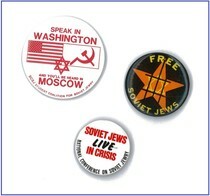 The American Jewish Historical Society has an Archive of the American Soviet Jewry Movement, with a backgrounder, timeline of major events, photographs, posters, and oral histories. 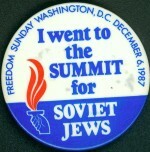 The National Conference of Soviet Jews (NCSJ), created in the 1970s as one of the premier advocacy organizations, maintains an archive of photos, posters, and a historical overview of the movement. On Dec. 6, 2012, the 25th anniversary of the Rally for Soviet Jewry in Washington, Tablet Magazine published an Oral History of the rally, which includes interviews with Natan Sharansky, David Harris, and others. 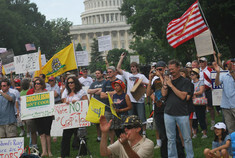 It offers many photos, including images of buttons worn to the rally. Students can relive history as it happened by reading articles from newspapers of the era. The JTA archive has a section devoted to Soviet Jewry. It offers a wonderful introductory essay by Gal Beckerman, with links to archived articles, followed by additional links. The Jewish Historical Society of Greater Washington has created an online exhibition “Voices of the Vigil: Documenting the Soviet Jewry Movement.” It includes a teachers guide to using the historical photographs and lesson ideas. The site also has oral histories of Washingtonians who participated in the Soviet Jewry movement to provide support to and seek freedom for Refuseniks. If your school subscribes to the ProQuest historical newspaper database, you can instruct students to search and learn about individual Refuseniks, as well as topics from a timeline of Soviet Jewish history.